As we look at the big picture of how our universe was created, new evidence has made that picture a little clearer. With the first image of gravitational waves, or ripples in space-time seen just after the Big Bang 13.8 billion years ago, scientists are given the best confirmation yet that the theory of inflation, proposed by Alan Guth in 1980, is an accurate description of the first moments of our universe. Fractions of a second after the Big Bang, space expanded exponentially in less than the tick of a clock. When the primordial universe bounded outward in inflation, enlarging itself 100 trillion trillion (!) more times than it had been less than a second before; what had been small fluctuations in density and temperature were amplified. This created density waves, which would eventually coalesce to from stars and galaxies. Scientists have predicted that this inflation following the Big Bang would have produced 'gravitational waves', with their signature left behind on the cosmic microwave background. Scientists have known about the cosmic microwave background for many years. The CMB, as it is called, is a cold radiation seen in all parts of the sky that is mostly uniform with small irregularities. It was the uniformity of the CMB that led scientists to develop the idea of inflation. Instead of an exploding fireball, the primordial soup of the universe had to have all been united in contact for a brief time, and only after that brief huddle did the tremendous expansion spread out across the universe so that areas that are not observable to each other still have the same characteristics. Because the CMB is a type of wavelength like light, it can also exhibit properties of light such as polarisation. This is what a team of scientists have found using a South Pole telescope called BICEP2 (Background Imaging of Cosmic Extragalactic Polarization). Gravitational waves created a twisting or curling pattern in the polarization, which was the first direct evidence of these primordial gravitational waves. Detecting gravitational waves has been considered to be akin to finding a 'smoking gun' in confirming the theory of inflation. Because the skies near the South Pole are so dry and clear, it makes an excellent observing location. The BICEP2 researchers looked at an area of sky one to five degrees across, or about two to ten times the width of the Full Moon. It took them three years to analyse the data so that they could be sure no errors had been made. The polarisation signal was even stronger than many had theorised. 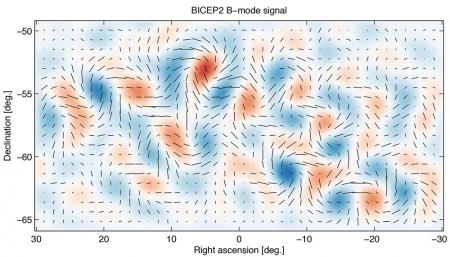 BICEP2 is a collaboration among students and scientists led by John Kovac of Harvard, Clem Pryke of the University of Minnesota, Jamie Bock of Caltech/JPL, and Chao-Lin Kuo of Stanford/SLAC.